As someone who is generally supportive of the Conservative party and who would quite happily describe himself as a Burkean/Pittite/Peelite Conservative, it may surprise some to hear me say I have always considered conservatism to be an idiotic inclination. The important distinction here is, of course, the lower or upper casing of the letter 'C'. Conservatism, with an upper case 'C', is a uniquely Anglo-Saxon ideology that developed at the end of the eighteenth century out of a desire to see liberal changes to government, society and the constitution enacted through a cautious, carefully considered process with a high premium placed on the wisdom of the past, the value of tradition and the stability of tried-and-tested institutions. It has no immediate corollary in Europe. Lower case conservatism, by contrast, is characterised by a stubborn, unthinking, resistance to change of any sort. It permeates all areas of society and, while we're on the subject of the eighteenth century, is illustrated no better that in the Church of England's attitude to wigs. There is no greater stranger to reason, no more dogged enemy of logic than the attitude of clergymen at both ends of the century to its most recognisable aesthetic feature. At the end of the seventeenth century, when wigs were becoming popular, they were denounced as ungodly. Yet, although the fashion was abandoned shortly after the French Revolution, they continued to be a familiar feature of clerical attire well into the next century. Unfortunately we are now seeing the very same thing from the Conservative back benches over reform of the House of Lords. As Daniel Hannan rightly points out, the very same arguments used against removing hereditary peers in the 1990s are now being resurrected to defend the raft of quangocratic life peers that were supposed to have destroyed the House. 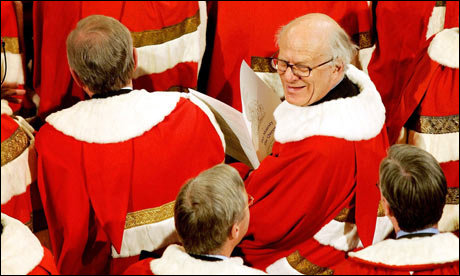 Personally, I believe the hereditary nature of the House of Lords was one of the great accidental triumphs of the British constitution, providing Parliament with a ready-made chamber of independently wealthy peers with a strongly-imbued sense of history, duty and patriotism; largely free from corruption, patronage, the need for a state salary and even, to an extent, the party whip. Most of all, however, these people were highly educated, with the time to seriously and deeply consider and revise legislation proposed by the Commons. They also served as the living embodiment of the medieval roots of English rule of law and democracy. But that's beside the point - we no longer live in a society in which the hereditary principle is a widely accepted form of government (one could even say it hasn't been so for the last 100 years). That being the case, it is pointless to cling onto this swollen (do we really need 789 peers?) House of cronies who have achieved their positions largely through their closeness to the government of the day. Baroness Ashton is a case in point. This woman, a lifelong quangocrat, has, through her appointment to the Lords, managed to rise to one of the most powerful positions in the European Union despite never having faced either the British or European electorate. Of course, that says as much about the EU as it does about the Lords, but here is another analogy - the European Commission demonstrates amply that politicians chosen by politicians representatives do not make. There have also been rumblings against the use of proportional representation to elect senators to the successor House. However, it only makes sense that a scrutinising chamber ought to be representative of as many differing views as possible in order to greater improve legislation that will have likely been passed by a single party majority in the Commons. It's also worth considering the fate of other appointed upper houses in the Commonwealth. In Canada, the Senate has been treated as the national problem - a quandary on par with the hereditary Lords - for most of its history. In New Zealand, the Legislative Council was abolished in 1951, leaving the country with a unicameral parliament and, therefore, no check on the excesses of the lower house. In Australia, by contrast, senators have been elected since 1901 and, after 1948, by proportional representation. The Australian Senate is actually more powerful than the House of Lords, though it is still a principally scrutinising chamber, and there do not appear to have been any constitutional contests between it and the House of Representatives which, we all now know, is elected by the Alternative Vote. Let's not end up like Canada or, God forbid, New Zealand. The Mother of Parliaments deserves better than this. Rather than clinging to a miserable little compromise (to borrow a phrase) let us move forward into this exciting constitutional development, to settle this question once and for all and to do it properly. But, if we are to be conservative, I would, in line with article 151 of the draft Bill proposals, beseech the reformed House to maintain the ermine robes used for new members and the opening of Parliament. Some traditions are just too stylish to dispose of.